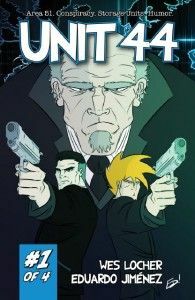 As is the story with many indie comics nowadays, Unit 44 first got attention on Kickstarter where writer Wes Locher raised enough money to get the first issue completed with art by Eduardo Jimenez and into print. As Wes states, “Unit 44 is a sci-fi/comedy comic book about what happens when inept Area 51 employees forget to pay the rent on the facility’s off-site storage unit, and the super-secret contents are sold at public auction.” It’s Storage Wars meets Men in Black and it’s a fun ride the whole way. Agents Hatch and Gibson work in Area 51, but when they forget to pay the rent on a storage unit containing alien corpses, alien weaponry, and various other secrets that the general public should never lay eyes on, they have to find the people who unknowingly bought all these secrets. Chester and Ike are the two rednecks who just happened to buy the unit at public auction. Though Hatch and Gibson find their men, and only beat them up a little, it seems that the otherworldly objects might not be as easy to locate as they thought. Locher and Jimenez come together to make a comic that’s not stuck in the gritty or grim mindset that some comics often fall in to. It’s a fun comic that will probably make you laugh at a few points, and that’s something that every comic reader needs more of. Hatch and Gibson are great foils for each other, one an imposing, stoic, orderly man and the other a slacker, and that makes for some fun moments in the first issue. Jimenez’s art keeps thing crisp and fun. There are bits of exaggeration in the characters when appropriate to play it up for the laugh, but it mostly stays pretty standard. The physical comedy, that played up with the body language, may just be the best bits in the book and that’s thanks in no small part to the way Jimenez is able to express the body language with his art. While, it’s obvious that I liked the issue, that’s not to say it was perfect. One thing that threw me more than anything was in a page where Ike and Gibson draw guns on each other. Ike has a revolver in one panel and a shotgun in the next, with no apparent reason/means for getting the shotgun. Maybe it was just something that flew over my head, but it took me out of the story for a bit. That said, the first issue is worth a read as it’s fun and contains some laughs. Even better is that issues 2-4 are currently being funded on Kickstarter, this time with the book having a home at Alterna Comics. Starting at $3 you can get PDFs of the first issue or even get a PDF subscription of all four issues for $15. Definitely give it a look!